Welcome to the webpage for the Harry Heafield Lodge (Number 10681) of the Royal Antediluvian Order of Buffaloes (RAOB). The RAOB is commonly referred to as the Buffs Club. The Harry Heafield Lodge, Lowton, was established in November 2010 and since then has been raising money to help local charitable causes in the name of Buffaloism. We are a fraternal benevolent organisation which aims to help those in need starting at local, community level. Membership is open to any male aged 18 years or older and who wishes to help local causes in the name of philanthropy. 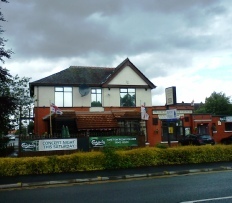 Our meetings take place every Sunday at 7.30 pm in Lowton Social Club as part of the Warrington and District Province. Are you interested in the welfare of your community? Are you willing to give a little of your time to help? Do you and your family want to make new friends, great social activity and a wonderful support network for you and yours? Visitors and new members are always welcome so please pop in one night and have a chat with a Buffalo ! Current memberships are renewable each January. New members can join at any time. £200 to the grandson of the late Harry Heafield who went to Tanzania to work in a hospital and found out that the staff there had to pay for their Hepatitis B immunizations, which they could not afford and if they caught the disease they would be out of work, so he donated £200 to buy the injections. In summary, a total of £2,705 has been donated by the lodge. The RAOB, under the Grand Lodge of England, has been in the community since 1822. History has shown that the organisation has taken on several guises. For example, during the First World War it provided ambulances and crews to the front line. It also took on running of orphanages and convalescent homes. Since then the order has continually been active in the support of local organisations through charitable donations and pro-active fundraising for such local causes.